Unilateral neglect is an attention disorder that arises as a result of injury to the cerebral cortex . Unilateral neglect is also commonly known as contralateral neglect, hemispatial neglect, visuospatial neglect, spatial neglect, or hemi-neglect  . In unilateral neglect, patients fail to report, respond or orient to meaningful stimuli presented on the affected side . In most cases, the right parietal cortex is injured and the left side of the body and/or space is/are ignored . Unilateral neglect is a heterogeneous condition; different individuals may present with different symptoms. Unilateral neglect may involve various modalities, including visual, auditory, somatosensory or kinetic . Unilateral neglect is generally classified in one of two ways: by the modality that is affected or by the space that is affected (i.e. personal or extrapersonal space). It is important to remember that these classifications may overlap and intersect . The incidence rate for unilateral spatial neglect following stroke in the United States is upwards of 80% in right-sided stroke patients . Right-sided unilateral neglect resulting from left hemisphere damage was found at least to some degree in 43.5% of stroke patients . One’s likelihood of having unilateral neglect following a left hemisphere stroke is substantially increased if there was damage to the posterior association cortex . A meta-analysis found that contralateral unilateral neglect is more likely following a right hemisphere deficit compared to a left hemisphere deficit . Between 12-100% of right hemisphere stroke, patients had unilateral neglect across 30 studies, whereas between 0-76% of patients with left hemisphere stroke had unilateral neglect across 17 studies . When comparing the effects of unilateral neglect between right and left hemisphere damage, they have been found to have similar levels of severity in acute brain injury patients . Age is correlated with increased risk for neglect following stroke. A study by Gottesman et al., found that 69.6% of people above 65 years of age had unilateral neglect following stroke while only 49.4% of people below the age of 65 had neglect. One’s chances of having unilateral neglect increases by 1.83% per additional 10 years of age after 65 . There are no gender differences in the prevalence or severity of spatial neglect following stroke . Unilateral neglect usually results from damage to the right parietal area, often the posterior parietal cortex . Normally, neurons in the right parietal cortex strongly attend to both the left and the right side of the space, while neurons in the left parietal cortex weakly attend to the right side of the space only . Therefore, in right parietal lesions, attention to the right side of the space is maintained by the left parietal cortex, but attention to the left side of the space ceases. In left parietal lesions, attention is typically maintained on both sides of the space by the right parietal cortex . However, lesions in different cortical and subcortical areas may also lead to neglect by causing dysfunction in brain networks . Usually, unilateral neglect results from stroke; however, it may also result from traumatic brain injuries or a neoplastic disease. Neglect is most likely in cases of large right hemisphere stroke . Unilateral neglect is a heterogeneous syndrome; the clinical presentation varies largely between individuals. Typically, the syndrome occurs following a lesion of the right parietal cortex of the brain, and the left side of the body or space is neglected. Right-sided neglect may also occur, but usually to a much lesser extent than left-sided neglect . In unilateral neglect, individuals behave as if the space opposite to the lesion does not exist anymore . Individuals may fail to report, respond, or orient to stimuli presented on the contralesional side . Visual, somatosensory, kinesthetic, and auditory modalities may be disregarded, despite intact primary visual/somatosensory/auditory/vestibular areas . Active exploration of the environment is also biased toward the ipsilesional side . The disorder may have a different distribution in different individuals: the neglect may differentially affect the personal space and the extrapersonal space . In neglect of the personal space, individuals fail to be aware of one side of their own body . They may fail to dress, shave, or groom the affected side . In severe cases, individuals may deny ownership of the limbs on the affected side, a phenomenon called somatoparaphrenia . In neglect of the extrapersonal space, the individuals fail to acknowledge and respond to stimuli located in their extrapersonal space . Typical behaviors include eating food only on one side of a plate and bumping into objects on the affected side as they navigate in space. Furthermore, individuals may either ignore visual stimuli on the affected hemifield, or they may ignore one-half of all objects (object-centered neglect), regardless of the location of the objects . Individuals with neglect also may shift their gaze toward the ipsilesional side when at rest . They may also shift their posture toward the ipsilesional side . Neglect may also affect internal maps of spatial representations . Representational neglect may be anterograde or retrograde. In anterograde representational neglect, individuals perceive stimuli in the contralesional hemispace but are unable to recall them. One example is the failure to recall auditory information presented on the affected side after distraction . In retrograde representational neglect, individuals are unable to recall the contralesional half of a previously known scene. However, they are able to recall those details when imagining themselves facing the opposite direction . In motor, or intentional unilateral neglect, the initiation of motor behavior may be affected . In motor neglect, the individual may be aware of the stimuli, but fail to move the contralesional side of the body to respond to them despite normal strength . In addition, patients may not realize that they are missing half of the space, a symptom called anosognosia . Unilateral neglect can often be seen in a patient’s behaviour even before a conclusive diagnosis, as there will frequently be a distinct lack of awareness displayed by the patient towards their affected side. They may exhibit behaviours such as only shaving half of their face, only eating half of the food on their plate, repeatedly walking into walls, etc. These behaviours should be the cue that initiates an assessment for unilateral neglect . However, it is possible that these symptoms could be attributed to other deficits following a stroke and it is important to rule out possible differential diagnoses, such as vestibular impairment, extinction, hemiplegia, hemianopsia, or somatoparaphrenia . It is important to remember that in a case of unilateral neglect these or other deficits may also be present and that testing for neglect should be done in such a way that these other deficits do not give a false positive or negative. To this end, there are several tests that specifically evaluate spatial or visual presentations of unilateral neglect. Traditional assessment of neglect uses a pencil and paper model to determine the patient’s awareness and processing ability in a close-up space. Examples of the traditional tests include, but are not limited to, the line bisection, the single letter cancellation, and the behaviour inattention tests. More recently there has been a shift towards more functional assessment, allowing the evaluator to determine which tasks of daily living the patient may struggle with. Examples of these tests include having the patient navigate an obstacle course or try to walk a straight line. One of the most common pencil and paper tests is the Line Bisection Test. In this test patients draw a line to indicate where they perceive midline to be on a horizontal line  . One of the most common functional tests is the Catherine Bergego Scale (CBS). This 10 item checklist is used mostly in the case of patients who have very few additional functional limitations and assesses functional activities such as grooming and eating as well as attentional and motor skills necessary to daily tasks . There are several other tests that can be used to assess and diagnose unilateral neglect; these tests are designed to cover the wide spectrum of presentations and spatial differences that may occur with unilateral neglect . There are two types of rehabilitation interventions used to improve neglect. The first one aims at improving the patient’s attention to the neglected space; the second one aims at addressing the proprioceptive and kinesthetic deficits (LoE 2B). These interventions may include the following methods: visual scanning/exploration training, neck muscle vibration, transcranial magnetic stimulation (TMS), optokinetic stimulation (OKS), cold water (caloric) vestibular stimulation (CVS), galvanic-vestibular stimulation (GVS), prism adaptation, limb activation training, mental imagery training, sustained attention training, eye patching, virtual reality training, trunk rotation training, transcutaneous electrical nerve stimulation (TENS), mirror therapy, and feedback training. Traditionally, treatment often also includes adapting the environment so that stimuli are constantly presented on the neglected side although there does not seem to be a lot of scientific evidence to support this (LoE 5). Physiotherapy typically involves treating the motor and sensory deficits caused by the stroke, but in stroke patients with neglect, it is important to ensure that the attentional deficits are addressed as well (LoE 5). Visual exploration training can be conducted by training both smooth pursuit and saccadic eye movements (LoE 1A). Patients performed smooth pursuit eye movements by following slow pencil movements performed by a therapist. Saccadic eye movement training can be achieved by using a computer program. In the program used by Schindler et al., patients had to identify whether the square that appeared on their screen was red or green as one task and read the word that appeared on their screen as a second task (LoE 1A). A potential benefit from this type of treatment is the acquisition of compensatory strategies (LoE 1A). Neck muscle vibration has a proprioceptive effect whereby it creates the illusion that these muscles are being lengthened (i.e. the neck is turning to one side) (LoE 1A). Vibration of contralesional posterior neck muscles when combined with visual exploration training results in lasting improvement in neglect symptoms specifically when measured by visual straight ahead, cancellation, tactile exploration, and text reading and also reduces difficulties that a patient may have with activities of daily living (ADL’s) (LoE 1A). TMS is a noninvasive method of stimulating the nerve cells in the brain with the use of short magnetic pulses. Repetitive TMS can be used to create significant, long-lasting decreases in unilateral neglect (LoE 1A). OKS uses movement on a large visual display to change a patient’s perception of where their body is in space with the assumption that they will try to reorient themselves based on this visual information. A systematic review by Kerkhoff & Schenk showed that there is a lot of evidence to support that OKS is an effective treatment for neglect (LoE 1A). OKS treatment combined with visual scanning training leads to significant improvements on neglect tests lasting less than a week and significant improvements on reading and writing tasks lasting more than a week (LoE 5). CVS stimulates the horizontal ear canal of the vestibular system using cold water for the contralesional ear or warm water for the ipsilesional ear, thereby inducing nystagmus. Multimodal positive effects can be seen with CVS including improved visual scanning, improved subjective straight ahead, and reduced somatosensory neglect. However, the effects of CVS are short-term (sometimes limited to 10-15 minutes), and repetitive CVS is not thought to produce long-term effects due to the adaptation of the vestibular system (LoE 1A). GVS is the electrical stimulation of the vestibular system achieved by placing electrodes on a patient’s mastoid processes. Similar to CVS, GVS appears to have a positive, yet short-term effect. More research is needed to determine if repetitive stimulation would have a long-term effect (LoE 1A). This treatment requires patients to wear right-shift wedge prism glasses/goggles. 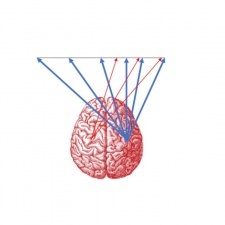 With the use of successive perceptual motor pointing tasks, adaptation to the prisms will occur (LoE 2B). This adaptation results in a shift of a patient’s perceived straight ahead towards the contralesional side, thereby correcting the ipsilesional shift exhibited by neglect patients. The evidence suggests that a single session will not result in lasting benefits, but multiple sessions (i.e. >10) could lead to longer lasting benefits (i.e. 5 weeks). However, the benefits of prism adaptation treatment are not greater than other forms of neglect treatment, neither is the process less time consuming (LoE 1A). Limb activation training involves getting the patient to perform active limb movements on the contralesional side of the body in an attempt to bring more attention to that side of the body. This has been shown to significantly reduce visual neglect (LoE 2B). Visual and motor imagery exercises can be used in individuals with neglect to improve contralesional space exploration as well as arm sensation and copying/drawing performance on neglect tests (LoE 2B) (LoE 3A). This can be achieved by having patients mentally practice positions and movements of the contralesional upper limb (LoE 3A). Sustained attention training increases a patient’s arousal through the presence of external alerting stimuli produced by the therapist and results in significant improvements in cancellation tests  (LoE 2B). An eye patch over the patient’s ipsilesional eye can improve symptoms of visuospatial neglect (LoE 2B). Virtual reality training can be performed through the use of a variety of different programs and has been shown to be more effective than conventional treatment for improving unilateral spatial neglect (LoE 2B). Trunk rotation training leads to improved visual exploration on the contralesional side and improved cancellation and line bisection tests (LoE 2B). Schindler and Kerkhoff achieved this training by having a patient sit in a chair and orienting them with their head and trunk fixated straight forward, head or trunk fixated 20 degrees to the left, and head or trunk fixated 20 degrees to the right. The results were that an orientation of the head or trunk 20 degrees to the left had a significant effect (LoE 2B). Electrical stimulation of the posterior aspect of the sternocleidomastoid muscle can be used to improve postural control in patients with neglect. Pérennou et al. set their TENS parameters to a frequency of 100Hz and a pulse width of 200us and noticed a significantly larger decrease in postural instability in stroke patients with neglect compared to stroke patients without neglect (LoE 2B). TENS treatment combined with visual scanning training leads to significant improvements on neglect tests lasting less than a week and significant improvements on reading and writing tasks lasting more than a week (LoE 5). Mirror therapy can be carried out, as was done by Thieme et al. by having the patient place both of their arms on a table with a mirror placed between their arms  (LoE 5). They are then required to look in the mirror while moving both arms. The reflecting side of the mirror faces the non-affected arm. Mirror therapy has been shown to have a significant effect on spatial neglect  (LoE 5). Feedback training can be achieved through verbal, video, and visual feedback. Simply pointing out a patient’s neglect behaviour (verbal feedback) or showing them a video of their performance can lead to an increase in self-awareness and a decrease in neglect symptoms (LoE 2B). Significant improvements in neglect symptoms were also seen in a study that used rod lifting as a form of visuomotor feedback. The intervention simply consisted of having patients lift and balance rods with a central grip; the rod provides immediate feedback as to whether or not their grip is actually central (LoE 1A). There is much evidence to support that it is “ unilateral neglect rather than overall stroke severity, that predicts poor outcome in right hemisphere stroke” . Patients with unilateral spatial neglect have poorer rehabilitation outcomes compared to similarly matched stroke victims without unilateral spatial neglect. Unilateral spatial neglect is correlated with an increased length of stay in an inpatient rehabilitation facility, as well as a slower progression . Patients with unilateral spatial neglect spend an average of eleven days longer in an inpatient rehabilitation facility and have less functional improvement per day compared to stroke victims of similar functional admission status who are not suffering from unilateral neglect . Recovery from visual neglect is most rapid over the first 10 days post-stroke and plateaus at the three months mark . The majority of patients will have minimal to no signs of unilateral visual neglect at three months post-stroke . The chances of a full recovery are higher in those who suffered a left hemisphere stroke compared to those who suffered a right hemisphere stroke . Unilateral neglect negatively affects disability one-year post-stroke; this has been found to be true regardless of a person’s pre-stroke cognitive levels . A study by Appelros et al., has shown neglect to be a valid predictor of dependency, but not an independent predictor of death one-year post-stroke. Research has found that having neglect adversely affects a person’s long-term prognosis in the areas of functional outcome, rehabilitation outcome, length of hospital stay as well as one’s discharge to home . Unilateral neglect is correlated with an increased need for sheltered living and home assistance . Compared to stroke patients without unilateral neglect, those with unilateral neglect had lower performance on measures of both sensory-motor and cognitive impairment as well as disability in activities of daily living and instrumental activities of daily living. This was found to be true following discharge from the rehabilitation hospital, and at four months and one-year post-stroke . ↑ Stroke Foundation. “Hemispatial Negelect Syndrome”. YouTube. March 19, 2013. Accessed 2017May8. Available from: https://www.youtube.com/watch?v=d4FhZs-m7hA.